With the proliferation of old fields and the decline of native grasslands in North America, non-indigenous grasses, which tend to colonize and dominate North American old fields, have become progressively more abundant. These new grasses can differ from native grasses in a number of ways, including root and shoot morphology (e.g., density of root mat, height of shoots), growth phenology (e.g., cool season vs. warm season growth), and plant–soil–water relations due to differences in photosynthetic physiology (C3 vs. C4). 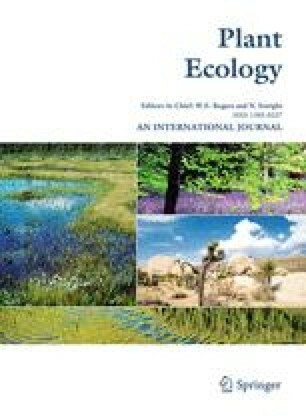 Woody plants have been slow to colonize some old fields in the prairie-forest border area of North America and it is hypothesized that non-indigenous grasses may be contributing to the poor establishment success of woody plants in this region, possibly through more intense competition for resources. To test this hypothesis, a multi-factorial field experiment was conducted in which water, nitrogen, and grass functional group (non-indigenous C3 and native C4 species) were manipulated in a study of survival of oak seedlings. The grass type variously affected some of the different growth measurements, however, the effects of grass type on seedling growth were small compared to the effects on seedling survival. The results showed that when grown under dry conditions, seedlings growing in non-indigenous grasses experienced up to a 50% reduction in survival compared to those growing in native grasses under the same conditions. Analyses of root and shoot competition showed that the cause for the reduced survival in the non-indigenous grasses was due primarily to underground processes. The findings confirmed our initial hypothesis that non-indigenous grasses are likely contributing to the poor establishment success of woody plants in these old fields. However, the explanation for the reduced oak seedling survival in non-indigenous grasses does not appear to be due to reduced resource availability since soil water levels did not differ between non-indigenous and native grass plots and other resource levels measured (light, NO3, and NH4) were higher in non-indigenous grass plots under dry conditions. An alternative explanation is that the non-indigenous grasses modify the soil environment in ways that, under dry conditions, are deleterious to emerging oak seedlings. Since current climate projections for the upper Midwest are for hotter and drier summers, the results suggest that the resistance of these old fields to oak encroachment will likely increase in the future.